What’s that on your head? A small dog wig! Small dog hair loss is a very serious problem. 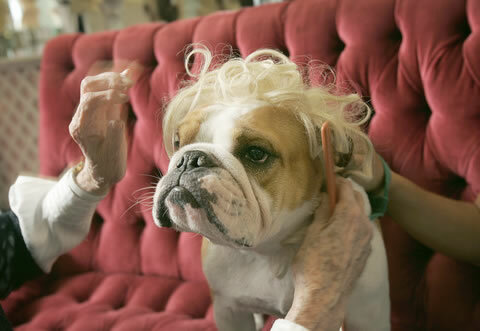 Also known as alopecia, it seems to particularly affect bulldogs, see photos below. Here’s a quick guide to what might be causing your small dog’s hair loss. Please check out i like dirt, for a more comprehensive photo study of this affliction. Entry filed under: JANUARY 2007.
my hair started to fall out once. i was unemployed and far from home and stressed beyond belief. After a while, the more i stressed about my hair, the more it fell out. soon, a kindly heath food store employee alerted me to a magical potion called “silica.” it made my hair grow back. maybe these dogs could use some silica??? where can i buy a small dog that comes with a wig? why did the small dog go to the thrift store to buy a wig? because he didn’t want to-pay! you love like you love small dogs, admit it. i do love small dogs. AND that joke! thanks for the small dog stories and pictures today. makes me happy. I think dogs are cute! I like the small ones. Can I see a picture of you? I like you because you seem smart. I would like very much to see a picture of you. If not possible, I would like very much to see a picture of you are body/parts/even hand or foot…fingernail…hair…please? I would like very much! i’m sorry. i can’t handle the last picture of that little dog. i want to eat it. thanks everyone for your input. i think you are right marcia, these small dogs could use some silica. also, stephanie, please see my previous post about how i don’t support or condone eating dogs (big or small), though i do understand the urge.